A primary purpose of the BWA is to support the propagation of Jodo Shinshu Buddhism throughout the world. To implement this purpose, our World Federation of BWAs is proposing to establish a Jodo Shinshu teaching position at the BCA’s Institute of Buddhist Studies in Berkely, California. IBS has been vital in spreading Jodo Shinshu not only in the Americas (North and South), but also in Hawaii, Canada, Europe, and Japan, etc. The GOAL is to raise three (3) million dollars with the interest earned yearly to be used to fund the teaching position of an instructor. This position will be named for two individuals close to our hearts – The Eshin-ni and Kakushin-ni Endowed Chair for Jodo Shinshu Studies. Each Jodo Shinshu Buddhist temple worldwide is being asked to support this project and the Hawaii Federation of BWAs is in favor of it. Each temple’s goal is approximately $300. The BWAs in Hawaii will spearhead this fundraising effort with all donations earmarked as coming from the entire temple membership. Deadline is December 31, 2018. Thanks to the hard work of many individuals, we have met Hawaii’s goal of $11,000. As of January 15, 2019, we have raised $14,631 from 21 Temple and BWA groups. Additional thanks goes to the Dharma School Teachers of Oahu and the Hawaii District Ministers Association. If your temple/BWA missed the deadline and would still like to participate in this worthwhile project, contact your United BWA President for more information. 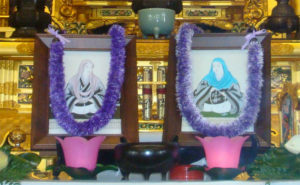 Images of Kakushinni, left, and Eshinni, right, at Hawaii Betsuin.